The fresh Brazilian Acai berry is known for its nutritional benefits. Its juice and pulp are used in various juice blends, smoothies, sodas, wines and liqueurs. 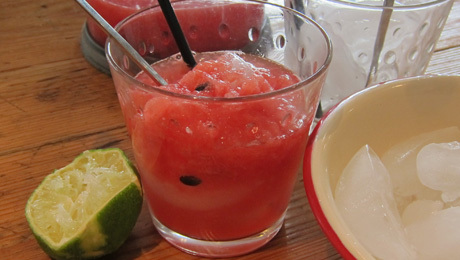 In a mixing bowl, or blender, combine the watermelon, cachaça, Acai syrup, sugar and lime juice. Using a mortar, crunch the watermelon cubes to release their juice, but don't completely liquify them; or, if using the blender, pulse until desired consistency - leave some small chunks of pulp. Fill a large tumbler glass with ice, then pour the drink over it. Do not strain the drink; instead, leave the seeds and chunks of pulp in it to add to its flavour and texture.